On Febraury 7th, 2019 PQube announced their first new IP project – the visual novel Kotodama: The 7 Mysteries of Fujisawa. Game is created with partnership between PQube and Japanese studio Art Co. LTD.
PQube is well known from releasing Japanese games and hope this Visual Novel will be a great piece of their library. If you don’t know PQube is a publisher and thanks to them we could play games like Steins Gate, Gal Gun, Song of Memories, Akiba’s Beat and many, many more. 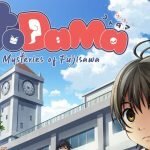 PQube puts all its expertise in to turn the classic high school story on its head, with a brand new universe where absolutely NOTHING is as it seems. Kotodama: The 7 Mysteries of Fujisawa will release this year on PlayStation 4, Nintendo Switch and PC/Steam. And if you’re OtakuGuru registered user, you can follow special page about game and be notified about new details.